A woman participates in a President's Day protest against President Trump's immigration policy at Union Square on February 18, 2019, in New York City. 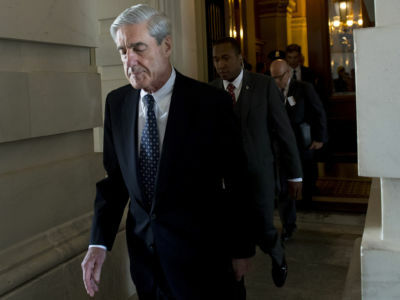 As readers of Truthout know, I have been on the Mueller report beat ever since Donald Trump fired FBI Director James Comey and the special counsel was appointed nearly two years ago. The report is done now, and all we the people have to show for it is a vapid letter from a political appointee and an existential headache that just won’t go away. During those two years, and definitely in the aftermath of the now-notorious “Barr summary,” the country divided itself into camps based on opinions of the investigation. Some saw the whole affair as a cover-up for Clinton’s defeat in 2016. Some didn’t buy it even without the alleged DNC skullduggery. Others invested an ocean of faith in Mueller, and still others waited and watched with tempered hope. Each group had its own arsenal of facts to deploy in its defense, and when the Barr summary hit, it served as a national Rorschach test for what these groups believed they already knew. There is another group, larger than all the others combined, for whom the Barr summary was simply a fait accompli. A whole lot of people whose faith in the concept of justice was already torn and frayed are now abandoning even the concept of hope. It isn’t difficult to understand why. The people whose bank accounts and political associations allow them to exist above the law don’t just win all the time nowadays; they rub their victories in our faces because cruelty and mockery are the new cool for the untouchable few. Sen. Mike Lee (R-Utah) provided a perfect example of the practice of mocking cruelty this week during floor debate on the Green New Deal. The outcome of the vote was preordained to favor the career climate denialists in that chamber; it would get no GOP votes, and most every Democrat voted “present” to thwart Mitch McConnell’s malicious intentions. Still, there was Lee in the well of the Senate with a poster depicting Ronald Reagan firing a gun with a bazooka strapped to his back while riding a velociraptor that was clutching a huge American flag, all of which was somehow supposed to disprove the existence of anthropogenic climate disruption. The most immediate reaction to such rank absurdity is to write Mike Lee off as just another far-right Republican brain donor, but that reaction misses the fact that these people pull these stunts with deliberate intent. Sen. James Inhofe (R-Oklahoma) didn’t throw a snowball at a Senate page just to “disprove” the existence of climate change; he wanted to make you too angry to think clearly. These people seek and receive the visceral reactions and the emotional disruptions that serve their ultimate ends. They scramble the conversation deliberately because their victory lies within that disruption. We can start to connect with each other by finding small ways in our local communities to push back against the ugliness of racism, sexism, nationalism and greed. Nazi comparisons are notoriously facile (paging Mr. Godwin), but the correlation is obvious to anyone who has been paying attention over the last several years… and therein lies the dilemma, because paying attention comes with a vicious personal cost, thanks to these tactics. Those people who refused to believe anything significant would come of the Mueller report were practicing enlightened self-defense. “I wonder how many times you have to be hit on the head,” asked Harry Truman, “before you find out who’s hitting you?” A great many people have found out, and are now checking out of any emotional investment in the concept of justice because, well, just look around. Ample reasons for despair are jumping off the front pages and pouring from the news networks like excrement from a shattered sewer pipe. One does not need to range very far to find a reason for throwing up your hands. And that is how fascists win. One solution to this crisis of the spirit, I believe, is to genuinely connect with other people by trying to help someone within reach of your arm. Working in a vacuum as isolated individuals, none of us can fix Trump, or the Republicans, or the Democrats, or the climate, or the media, or greed, or war, or any of the other massive problems before us. We can, however, start to connect with each other by finding small ways in our local communities to push back against the ugliness of racism, sexism, nationalism and greed that we can see in our own institutions and from our own windows. We can also connect with activist movements that already have momentum and the capacity to connect us to others working on these issues nationally and globally. Despair is contagious, and right now it’s spreading. To act is to be, and there is so much to do. By helping your neighbor, you will be helping yourself return to a place inside where hope is more than a four-letter word.